Thanks to Google Earth we can now see the Royal Wedding route in 3D. The route between Buckingham Palace and the Abbey goes by The Mall, Horse Guards Road, Horse Guards Parade, through Horse Guards Arch, Whitehall, Parliament Square (the south side) and Broad Sanctuary. The additional route from the Goring Hotel to The Mall goes by way of Grosvenor Place, Buckingham Palace Road and Buckingham Gate to The Mall. The Wedding Service will be relayed by audio speakers along the Route. This is in addition to the screens already announced at Hyde Park and Trafalgar Square. 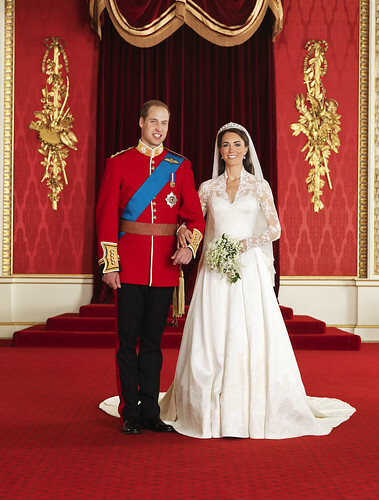 Miss Middleton and Prince William will travel separately to the wedding service using State Cars from the Royal Mews. Miss Middleton will travel in a Rolls Royce Phantom VI, accompanied by her father. The Rolls Royce was presented to The Queen in 1978 for her Silver Jubilee by the Society of Motor Manufacturers and Traders. Prince William will travel in a Bentley, accompanied by Prince Harry. The State Bentleys have been uniquely designed enabling greater use to be made of the vehicle’s interior space. The Bentleys are 6.22 metres long and, at 3.84 meters, their wheelbase is 1.3 metres longer than that of an average family sized saloon. State cars are painted in Royal claret livery. The Rolls-Royces and Bentleys do not have registration number plates, since they are State vehicles. On processional occasions, the State cars travel at around nine miles per hour, and sometimes as slow as three miles per hour. The State Car collection includes two Bentleys, three Rolls-Royces and three Daimlers. Members of the Royal Family and Miss Middleton’s parents and siblings will travel to Westminster Abbey in cars and motor coaches organised by the Royal Mews. All the motor coaches used on the day have been supplied on a temporary loan from Volkswagen for the wedding, and will be driven by drivers from Westway Coaches. At the end of their wedding service at Westminster Abbey, Prince William and Miss Middleton will travel in the 1902 State Landau along the Processional Route to Buckingham Palace. The route will include Parliament Square, Whitehall, Horse Guards Parade and The Mall. In the event of severely wet weather, the couple will travel in The Glass Coach. There will be five horse-drawn carriages in the Carriage Procession from Westminster Abbey to Buckingham Palace. The first carriage will be the 1902 State Landau or Glass Coach carrying the Bride and the Bridegroom. The second and third carriages will be Ascot Landaus carrying the Best Man, Maid of Honour and Bridesmaids. The fourth carriage will be a Semi-State Landau carrying The Queen and The Duke of Edinburgh. The fifth carriage will be a Semi-State Landau carrying The Prince of Wales, The Duchess of Cornwall and Mr. and Mrs. Middleton. The 1902 State Landau is painted in a lighter shade of maroon than the other coaches and richly adorned with gold leaf and upholstered in a crimson satin. It is normally used open, and drawn by six horses. The Glass Coach was built in 1881 and was purchased for use at King George V’s Coronation in 1911. The Glass Coach has carried previous Royal brides to their weddings – Lady Elizabeth Bowes-Lyon in 1923, Princess Alexandra in 1963, Princess Anne in 1973, Lady Diana Spencer in 1981 and Miss Sarah Ferguson in 1986. It has also carried the bride and bridegroom from the church, as it did when Princess Elizabeth married The Duke of Edinburgh and again when Princess Anne married Captain Mark Phillips. The Glass Coach was built by A. Peters and Sons, as a sheriff’s town coach before being purchased shortly before King George V’s coronation. It is driven by a coachman from the box seat with two or four horses, has special interior lighting and is known as the Glass Coach on account of its large glass windows. There are five Ascot Landaus in the Royal Mews. Two of these will feature in the Procession. Ascot Landaus are always used for The Queen’s procession up the course at the Royal Ascot Race meeting and also for other visits of an official nature. They have been used for The Queen’s coronation visit to Edinburgh, the Investiture of The Prince of Wales at Caernarfon Castle, The Queen’s silver Jubilee visits to Glasgow and Cardiff, and on State Visits following the 1902 State Landau. They are also used to transport new High Commissioners of Republics within the Commonwealth when they are received by The Queen. The Semi-State Landaus are used for a variety of Royal occasions. The Royal Mews is part of the Lord Chamberlain’s Office and is run by the Crown Equerry. The Royal Mews houses 30 carriage horses and has 38 staff including liveried helpers, coachmen and chauffeurs. There are two breeds of horses at the Royal Mews: Windsor Greys and Bays (the majority of which are Cleveland Bays). Eighteen horses will be involved in the Carriage Procession. There are over 100 carriages in the Royal Mews collection, although not all of them are kept at Buckingham Palace. For the Royal Wedding, 14 sides of State Harness will be used with matching appointments for outriders. All the harness requires regular cleaning and polishing, an activity undertaken by Royal Mews staff in addition to their other duties.